Feel like you’ve lost your blogging mojo lately? No matter how many drafts you end up writing, none of them says what you have in mind. Your headline stinks, your post reads like a term paper, and you have a boring intro. You end up chalking it up to blogger’s block and barely having time to write because you want to relax and enjoy your weekend. Well, wouldn’t it be nice to whip up a blog post that holds a reader’s attention, grips them to the edge of their seat and gets them to sign up for your newsletter – all without a million drafts or a hundred headaches? Want to improve your writing? Blogging Wizard subscribers get free access to our guide on “How To Write Content That Turns Casual Readers Into Raving Fans” in our VIP Resource Library. You’ll also get access to 15+ other helpful blogging guides, templates and checklists. Not subscribed yet? Sign up here. Blogging didn’t come naturally to me. When I sat down to write my first blog post, I wrote it as if I was in school. I followed all the grammar rules, made sure I had a thesis statement and well-developed paragraphs and didn’t deviate from my outline. Was it easy-to-read? I doubt it. Was it engaging? Is someone actually going to read this? You see, I had to learn how to write a blog post that piqued a reader’s interest and kept their curiosity throughout the entire post. For some, this is second nature, but for the rest of us, blogging is an art. From having an eye-catching headline to making sure your post is easily scannable to giving your readers a call-to-action that’s meaningful and powerful, blogging isn’t just another journal entry. It’s a place to share your experiences, offer tips and make a real difference. Blogging can also be a great content marketing tool – a place to show your expertise – where you can make money, help people, and connect with others just like you. Since I first started freelancing and blogging regularly, I learned there’s a way to inject more engagement in your post so you can generate more traffic and create a strong and loyal following. And it can make you a better blogger. You’ll have better blog posts that people will actually read and share. Want more comments? More subscribers? Content that gets people talking? Copywriting can do that and more. It’s the one quick thing that can make your blog successful, but not many people know how to use copywriting in their content to convert or persuade. 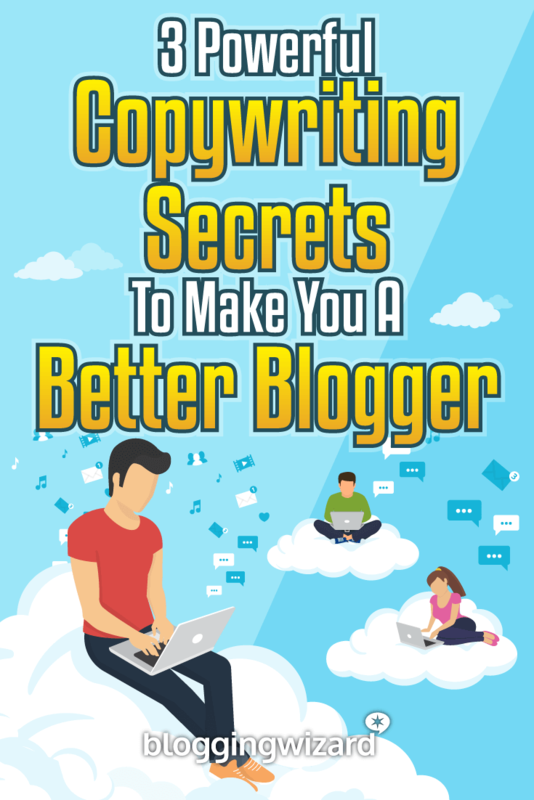 So, to get you in the persuasive mindset, let’s look at three copywriting secrets to help turn any blogger into a writing rockstar. Your headline has to grab the attention of readers and get them to click and read your post. Copywriters use the 4 U’s formula when they have to write a headline or email subject line. It’s what can turn a bland and boring piece of copy into a dynamic and attention-grabbing headline. Michael Masterson, one of the best copywriters around, originally developed the 4U’s best-kept secret. 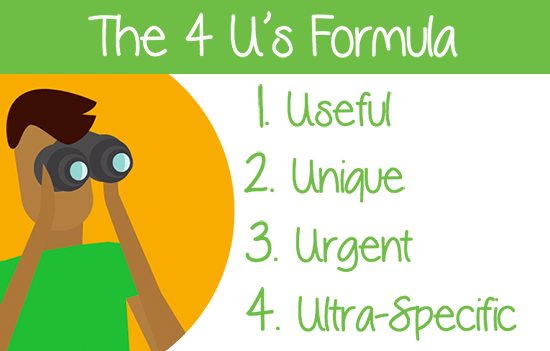 Let’s take a closer look at how you can make a compelling headline using the 4 U’s formula. No one’s going to read a post that isn’t useful to them. By giving your audience a reason to read your post, it will compel them to keep on reading. For example, would you want to read a post that’s titled My Road Trip With My Children or 3 Fail-Safe Tips For a Happy Road Trip With Little Children? Both posts talk abut the same thing, but, while the first title focuses on the blog writer’s road trip, the latter version gives a reader a benefit – happy children – and tells you exactly how to achieve this – with three fail-safe tips. This makes it useful to the reader. How do you make sure what you’re writing about is unique? Everyone’s written about SEO or blogging, so how do you make yours different? If you don’t want your readers to yawn and gloss over your headline because they’ve already seen it before, add a little personality to it. It’s brazen, shows the brand’s personality, and you can bet their tagline isn’t similar to anyone else’s tagline. Often you will notice urgent headlines for email subject lines or for products and services. 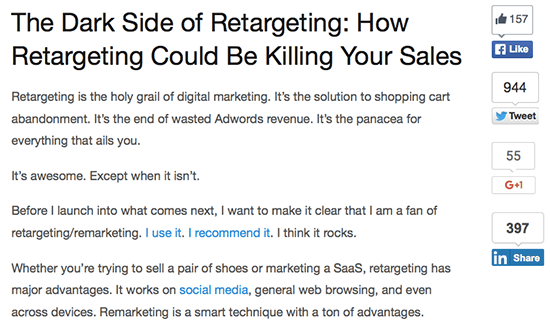 If you’ve heard how great retargeting is for your business, reading this headline might urge you to read it or at least bookmark it for future reference. Some of the best blog posts are ultra-specific to their target audience. 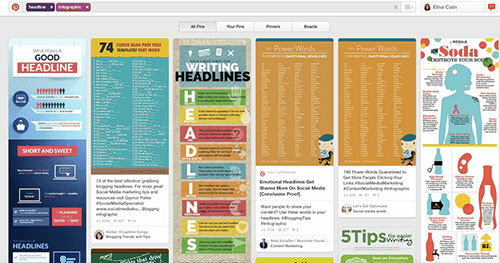 The more specific your headline is, the better success the post has at resonating with the right people. 10 Time-Saving Blogging Tools to Keep You Organized – It’s a list post so this immediately tells you how many tools you’ll read about, and it’s specifically for bloggers. How to Grow Your Blog’s Audience (And Keep It) – This is a how-to post, which tells a reader they will learn exactly how to do something. For this blog title, it’s specific to growing and keeping your blog audience, something every blogger craves. Do you find yourself sometimes reading blog posts or perusing on Twitter when something catches your eye? It could be a headline or an image or just a phrase in a blog post. It’s a good idea to keep these nuggets of content in a digital swipe file. A swipe file is a collection of headlines, blog posts, opt-ins – nearly anything you see online that catches your eye. While copywriters use swipe files to catalog effective copy, you can use it to store headlines that grab your attention, take screen shots of a compelling opt-in or just a web page layout you like. Now, this doesn’t mean you are stealing these ideas – you’re just using them for inspiration. This comes in handy when you’re stuck and can’t think of anything to write, or if you just need a little help with the finishing touches of a post. This is a great way to always have fresh new blog post ideas, and it can help you understand which headlines or which blog posts grabbed your attention. Some of the best content to put in swipe files are infographics because you get a lot of information and tips in one place. You can find hundreds of infographics on Pinterest. While you can use Pinterest to pin favorite recipes, DIY tutorials or interesting blog topics, there are other sites designed as a swipe file of sorts. Both Dribbble and FFFFound offer a place to store and share favorite images you see online. Originally, this formula was used for direct mail copywriting but has since been taken over by content marketers. This effective formula is designed to immediately grab a person’s attention, hook them into reading more of your content and lead them to take action at the end of your content. And this is what you want to do in your blog post, right? Let’s figure out what AIDA is and how we can use it in our writing. AIDA stands for Attention, Interest, Desire, and Action. Having these four elements in your blog post will not only attract more readers, but you will get more engagement, and if you are monetizing your blog, this is essential to your success. So, let’s put this into action. Your headline and intro are the two most important parts of your blog post to hook a reader in. Ask a ‘yes’ question – This is a little trick many copywriters use and is something many bloggers use too. Open your blog post with a question that has a ‘yes’ answer. This immediately makes your post more engaging and conversational. Secondly, when a person answers ‘yes’ to your question, this means they want to learn more about the topic, and they are more likely to read your post. Tell a story – When you tell a story, your audience can relate to you, making them more likely to want to read your post. For example, this blog post opened up with a story about how blogging can be difficult for many people. Next, you want to hold a reader’s interest in your post. Often you can relate to your audience by showing you recognize their struggles and understand their problem. She does a great job relating to her audience and understanding the reader by stating the dedication bloggers have and the hours it takes to maintain a site. Then she piques their interest by stating the problem of missing data. Now, you want to know how to solve this problem and will likely read the post. Some of the best bloggers can tap into your vulnerabilities and fears in a blog post and, at the end of it, you have the desire to change all that. For example, Jon Morrow does a fantastic job at pin-pointing your anxieties and stressors about blogging, and then giving you an emotional pep-talk on what to do about it. Having the passion to help people will come out in your writing. Use this emotion to create desire in your readers. Make them crave every word you write, waiting excitedly for your next blog post to come along. Each of your blog posts should direct a reader to take some action. This is known as a call-to-action. This can also be a lead magnet at the end of your blog post or just a simple question in your conclusion. Your call-to-action is also a great way to spark engagement in the comments section. Ask a question to get your readers talking and participating in your discussion. Writing for your blog doesn’t have to be the last thing on your to-do list. By using some clever copywriting tricks, writing can become a cinch, making you want to tackle each day starting with a blog post. And don’t think you won’t get noticed when you add a few copywriting elements to your post. People will start to realize just how better your blog writing is. So, if you’re looking to add a little persuasiveness to your copy, try these tips and watch your audience appreciate every post you write.